2" x 1" Direct thermal polypropylene label. Black mark sensing, Not perforated. 350 labels/roll, single roll. Also available as a case (Part# LD-R7BL5B). 2" x 1" Direct thermal polypropylene label. Black mark sensing, Not perforated. 350 labels/roll, 36 roll case. Also available as a roll (Part# LD-R7BL5B-R). 2" x 1.25" Direct thermal polypropylene label. Protective Overvarnish, Black mark sensing. 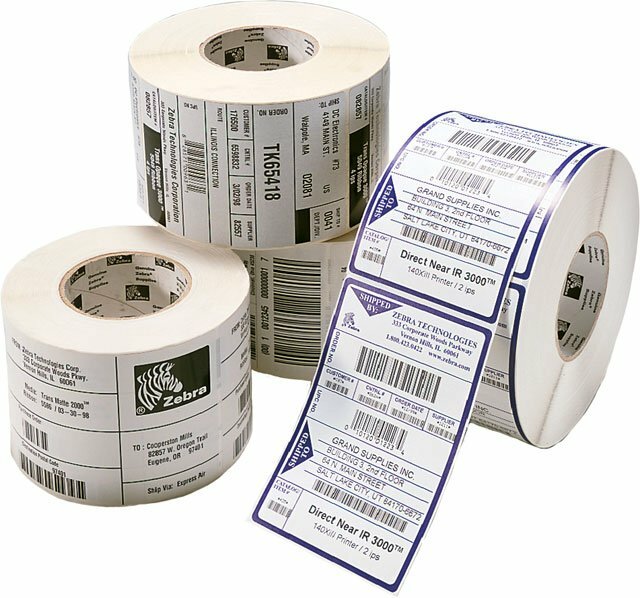 For use in water temperatures up to 160 degrees F. 380 labels/roll, 12 roll case. 2" x 1.25" Direct thermal polypropylene label. 380 labels/roll, 12 roll case. 2.20" x .50" Direct thermal polypropylene jewelry Butterfly label. Black mark sensing, Flaps. 4,400 labels/roll, single roll. Also available as a case (Part# 10010062). 2.20" x .50" Direct thermal polypropylene jewelry Butterfly label. Black mark sensing, Flaps. 4,400 labels/roll, 6 roll case. Also available as a roll (Part# 10010062-R). AIT, CONSUMABLES, POLYPRO 4000D, DIRECT THERMAL POLY LABEL, 2" x 1.25", Perforated, 2,189 LPR, 1" CORE, 5" outer diameter, single roll. Made to Order, contact us for lead time. CONSUMABLES, DT, POLYPRO 4000D, 2" x 1", 3" ID, 7.9" outer diameter, PERMANENT ADHESIVE, PERFORATED, 5997 LPR, single roll. Made to Order, contact us for lead time. ZQ520R Label, Synthetic, 3x1in (76.2x25.4mm); DT, PolyPro 4000D, Value Coated, All-Temp Adhesive, 0.75in (19.1mm) core, RFID, Single roll. Industrial Label, Polypropylene, 2 x 1.25in, Direct Thermal, PolyPro 4000D, 3in core, 6 Rolls/Carton, Single roll. Made to Order, call for lead time.